Usually when a celebrity is involved with an apparel label, the chances of putting out quality lines is very slim. Not in the case of William Rast. Justin Timberlake, recently nominated as one of the 10 most stylish men in America by GQ magazine, together with childhood friend and business partner Trace Ayala have put togehter a collection that revives the true meaning of great American fashion. With designers Johan and Marcella Lindberg in tow, the lines screamed denim and leather: always a great combination. The theme of "A New America" was quite fitting to describe the evening. From the clothes, to the models, to the music, and the crowd every detail resonated "fresh, new, innovative". 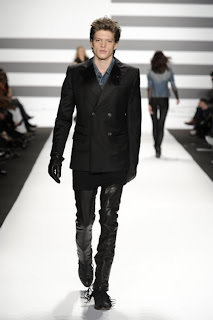 Both men and women rocked the runway with tassled jackets and boots. Guys wore extra long tanks alongside slim fitting blazers. Girls wore studded motorcycle jackets, tailored vests with sweeping lapels, and capes to complete the all-american look. 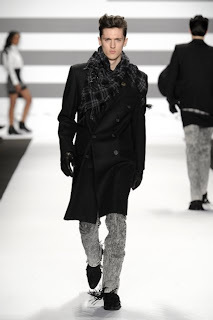 All in all, it was a fantastic show and a great way to cap my experience at New York Fashion Week. 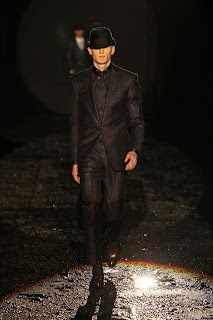 Its not always that you see male models walking on a black dense foam runway, splattered with water to recreate a rainy day in the streets of New York or London. To further exaggerate this scene, the coats and jackets were sprayed with water making the collection very convincing for the season. 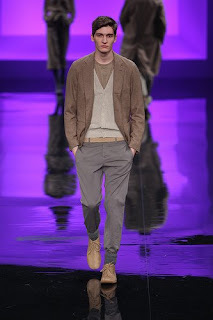 Z Zegna is a fashion forward, innovative and urban brand geared towards a new and younger consumer. With a combination of quality and style, the label produces unique pieces that spices up every man's wardrobe. 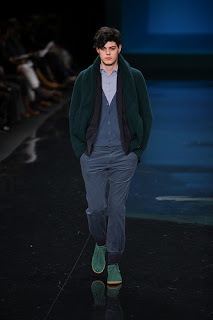 This season there was a huge focus on classic overcoats cinched with a variety of belts, muscular and powerful silhouettes in the jackets, and innovatively cut tailoring in their double breasted suits in wool and lurex (metallic). There was also a hint of vintage with accessories such as ascot ties, Edwardian-style hats in angora, and doctor's cases that helped finished the looks on the runway. Fake eyeglasses. The bigger the rims, the better. Duffles, Doctor Bags, Weekenders, and Totes are the most popular types of MAGs (Men's Bags) this season. Fur trims on coats and hats. Bow Ties. Dress them up. Dress them Down. Preppy is still in with white pants, colored ties, tailored overcoats. Calvin Klein once said "We`re not doing outrageous fashion; I make sports clothes that are relatively conservative, clothes that everyone wears." And that continues to remain true up to this day. Starting as a coat shop in New York City in 1968, Calvin Klein has mastered the art of simplicity. He sets his own trends in a very subtle way. He makes his clothes accessible. This season is no different. 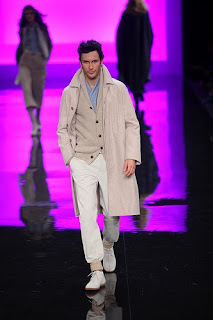 From the jackets to the trousers, each piece depicts clean lines and monochromatic tones. There wasn't anything exaggerated. Nor was there anything dramatic. The lines were very clean, understated, and simple. The tones were varying shades of grey and black. The fabrics ranging from wools, cottons and metallics. "Nothing gets in the way of me and my Calvins" -- a tag line made famous by a 15 year old Brooke Shields in the company's earlier advertising campaigns. A lot of men can still probably say this especially with this collection that I guarantee will stand the test of time. Its been a day of great shoes so far. 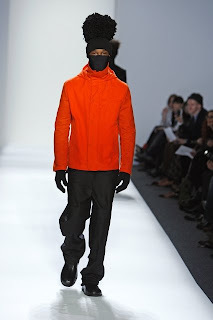 And what better way to cap Day 2 of New York Fashion Week but to see Monarchy's much anticipated FW09 collection. Led by Chief Designer, Eric Kim, Monarchy continues to blow my mind with the creativity and originality of their pieces. The category they're in is fairly saturated with the same designs from brands like Diesel, G-Star and Sixty. And to survive in this business, Monarchy sets itself apart by integrating a variety of pieces and fabrics in a way that no one else can. 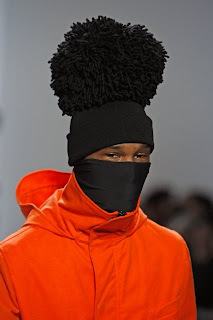 Fashion forward. Eclectic. Euro Rock. Edgy. Equestrian. Raw. Classic. These are some of the terms I would use to describe this season's line. Motorcycle jackets with high necks. Leather coats with built in hoods. Three piece separates. Military inspired pea coats. As much as I wished I had every piece in my closet, here are my top picks. Three piece suit seperates, with the bowler hat, and riding boots. Images by Dan Lecca for Mercedes Benz Fashion Week FW 2009. Lacoste suggests stuffing your pants into your socks. Lacoste has gone a long way from the preppy tennis shirts and crocodile logo we all have learned to love. Seen a lot during the summer time, I don't doubt that the pieces shown in this FW09 collection will soon be staples in men's closets everywhere. Sticking to the monochromatic and layered textured trends, Lacoste dares to be different by going with the Trinity Creme colored suit ensembles and the Sandy Beige coats. From there, they extended their color palettes to tones like Ash Grey and Cocoa Brown. The two most notable trends were the oversized sweaters, ankle high boat shoes and this whole "stuff your pants into your socks" thing. Cocoa Brown Crushed Velvet Blazer with Gray Cardigan. Seeing the African Fashion Collective Show at Fashion Week was like being taken to a new time and place. Africa is such a powerful nation with a deep culture and history. Being in line with individuals that represented this country either by the color of their skin, or through their lineage, was an honor. Tyson Beckford, co-host for the new reality series Make Me a Supermodel, was the only male African-American that graced the runway for this showing. 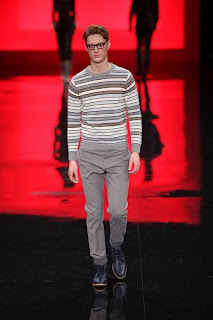 Wearing a black suit with cherry red stitch detailing by designer Lamine Badian Kouyaté for Xuly Bet, Tyson's look was also complemented by a teal-tan plaid duffle. Side note, the whole "Mens Purse" trend has been kicked up a notch this season. Models and attendees alike are carrying both oversized attaches', messenger bags and duffles. Something to keep mind if you're looking for an accessory to finish off your look. 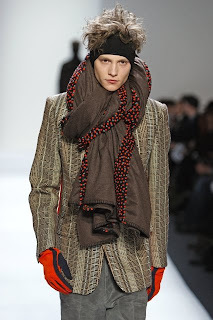 Duckie Brown starts the week off with Multi Textured Layering and Oversized Scarves. At around 1:30pm this afternoon, New York's Bryant Park was filled to the brim with good looking people. Most of them in line to see the Duckie Brown collection for FW2009. The label started by Steven Cox and Daniel Silver in 2001 continues to put out great pieces each season. Generally speaking, fall winter wear for guys tend to be monochromatic. 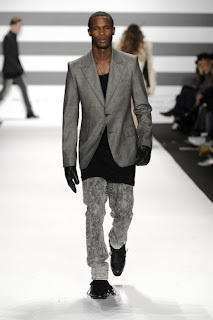 But Duckie Brown sets the pace by isolating pops of color and layered textures in a guy's wardrobe ensemble. From a mixture of fabrics to a mixture of colors, Duckie Brown is a wizard in creating a balanced look for the sophisticated man. 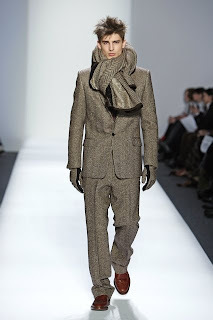 Tweed Suits, Suit Separates, Oversized Scarves. Images by Dan Lecca for Mercedes Benz Fashion Week, FW 2009, NYC.